From left: Scott Restmeyer of the Collider-Accelerator Department (C-AD), Tiffany Bowman of Creative Resources, and Julio Renta, C-AD. Restmeyer and Renta built a hands-on model of the National Synchrotron Light Source (NSLS-II). Bowman added the final touches to the model by creating the detailed labels for the components. The model will be used at the Lab's Science Learning Center and outreach events to help explain how NSLS-II works. When Scott Restmeyer and Julio Renta first joined the newly-formed Maker’s Club at the U.S. Department of Energy’s (DOE) Brookhaven National Laboratory, they weren’t totally sure what type of projects they would be working on. But, soon after they joined, along came an exciting request from Kahille Dorsinvil of the Lab’s Stakeholder and Community Relations Office. 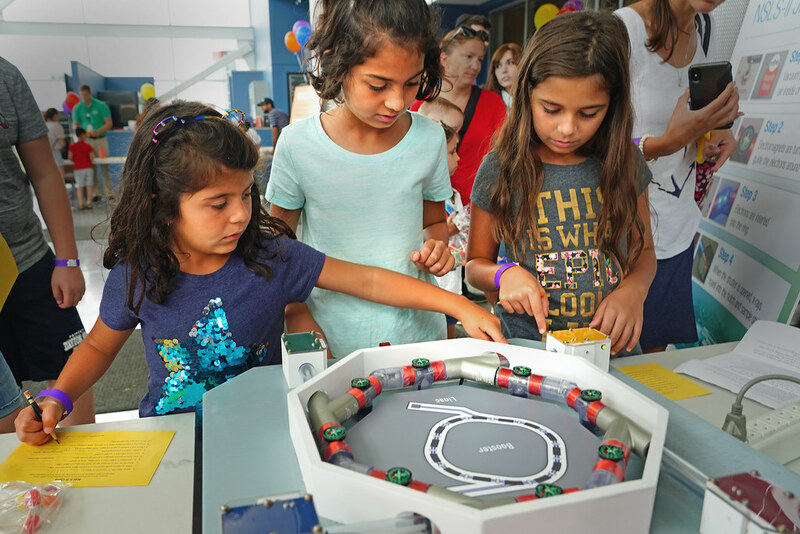 Dorsinvil asked for help in rebuilding a tabletop model of the National Synchrotron Light Source II (NSLS-II)—a DOE Office of Science User Facility at Brookhaven Lab—that could be used by visitors at Summer Sundays and other outreach events at Brookhaven. Restmeyer and Renta readily volunteered for the project, knowing it would be a challenge, but they quickly laid out a plan. Renta, a senior technical specialist in Brookhaven’s Collider-Accelerator Department (C-AD), offered the electrical and programming skills while Restmeyer, senior designer in C-AD, provided elite mechanical skills — the perfect combination for this project. What does the model look like and how does it work? Built on a wooden base, the model includes toggle switches to turn on the vacuum pump, magnets, and beam, plus a shutter button, four hutches with sliding doors, and clear tubing with lights and mounted compasses. The lights will circulate and increase speed to simulate the beam. There are also arcade buttons which send simulated x-rays in to the hutches (when the hutch doors are closed). “Operators” first start the vacuum pumps by flipping a switch. Electrons at NSLS-II cannot travel through air, so it is important that the vacuum pumps get switched on. Next, the “operator” needs to hit a switch to turn on the magnets. At NSLS-II, magnets ensure the electrons follow a steady path and can turn the corners in the storage ring, where they will eventually emit ultrabright x-rays. The “operator” can let the electron beam into the ring where it will circle around. In the final step, the “operator” closes the experimental hutch and opens the shutter to let the ultrabright x-rays into the hutch so that they can interact with scientific samples. The model intricately labels all these steps and Summer Sundays visitors were thrilled when they were successful in getting the x-rays into the experimental hutch. Do you like to do woodworking, metal working, 3D printing, make jewelry, or work with computers, electronic gadgets and robots? Are you someone who just likes to tinker? Then, consider joining the Lab’s Maker Club. A BERA-sponsored organization founded in February 2016, the Maker’s Club meets to share creative ideas, knowledge, and techniques. No experience is necessary. Tiffany Bowman, a graphic designer in the Lab’s production services division, added the final touches to the model by creating labels for NSLS-II’s control panel, booster and linac, beamline hutches, and vacuum pump. Bowman also created the poster that describes how to operate the model and what is happening when a switch is flipped, or a button is pushed. Renta and Restmeyer are already looking for a new project. Do you have any ideas? If so, come to a Maker’s Club meeting. For more information about the club, contact William Jackson, Ext. 7139, wjackson@bnl.gov .